Christian Bale (Dan Evans), Russell Crowe (Ben Wade), Ben Foster (Charlie Prince), Logan Lerman (William Evans), Peter Fonda (Byron McElroy), Gretchen Mol (Alice Evans), Lennie Lofton (Hollander). The acting in this movie is excellent. It started out being about shootouts, cattle stampedes, and robberies; and ended up as a study in character. 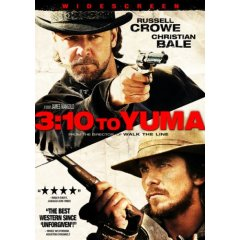 Christian Bale plays the part of Dan Evans, a rancher down on his luck who agrees to join a posse and help bring highwayman Ben Wade to justice. He is hoping that the $200 will get him out of debt and save his ranch. Russell Crowe plays the part of Ben Wade, a ruthless robber and killer. At first there seems to be nothing to this character but a lust for killing with a drive to be all bad and surprisingly evil. Later he is shown to have a few redeeming traits and some depth. He is shown to be not entirely bad after all, though you could not prove it to all the people he kills, including some of his own gang. The ongoing byplay between Evans and Wade is worth the price of admission. Ben Foster plays Charlie Prince who is second in command of Wade’s gang. His screen presence is remarkable and cannot be ignored. Peter Fonda plays McElroy so well that you are not even aware that it is Fonda playing the part. Dan’s son William, played by Logan Lerman, does not respect his father in the beginning and constantly puts him down. It is all changed by the end where both respect each other and Dan is secure with the thought that his 14 year old son is mature enough to care for the ranch and the family if something should happen to him. This is an excellent movie and I enjoyed it on a number of different levels. The shoot out, the fast horses, the fast action pace with surprises around every turn was remarkably sustained. The many different interesting characters, some just in passing, added additional depth to the movie. Toward the end, time seemed to stand still as everyone waited for the train to show up and signal the beginning of the final shootout. Finally, interesting religious themes pervaded the entire movie. The ending didn’t seem to be a surprise at first, things went pretty much as one would have expected. Then the unexpected happened, then the implausible, and finally the open ended resolution. To say more could ruin the effect and be a spoiler. « Is Clinton Blocking the DVD of “The Path to 9/11″?